12 October 2012 – I’m addicted!! My name is Rebecca and I’m addicted to Pinterest!!! I just love it!! I’ve pinned so many cards to make. I don’t think there is enough time to make everything I’ve pinned!! But I have been inspired by them all. Here is a card from a fellow Stampin’ Up! demonstrator from Germany, Judith Laureano. I changed a couple of details as I used the Adorning Accents edgelit for the scallops and the Decorative label punch for the sentiment. 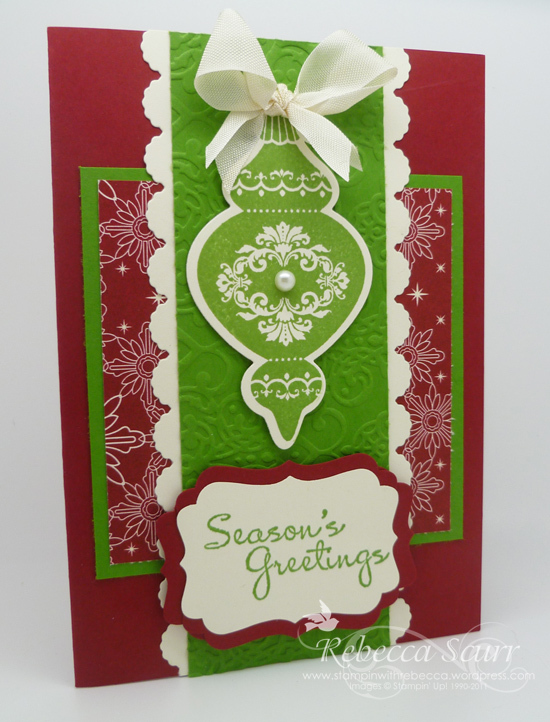 I really love the Lacy Brocade embossing folder. It is very noice!!! Paper: Be of Good Cheer DSP, Very Vanilla, Cherry Cobbler, Gumball Green. Accessories: Big Shot, Holiday Ornament Framelits, Adorning Accents Edgelits, Pearls, Very Vanilla seam binding ribbon, Decorative Label Punch. « 10 October 2012 – I love Ornaments!